An individual who is licensed to engage in the business of manufacturing, importing and/or dealing in firearms. 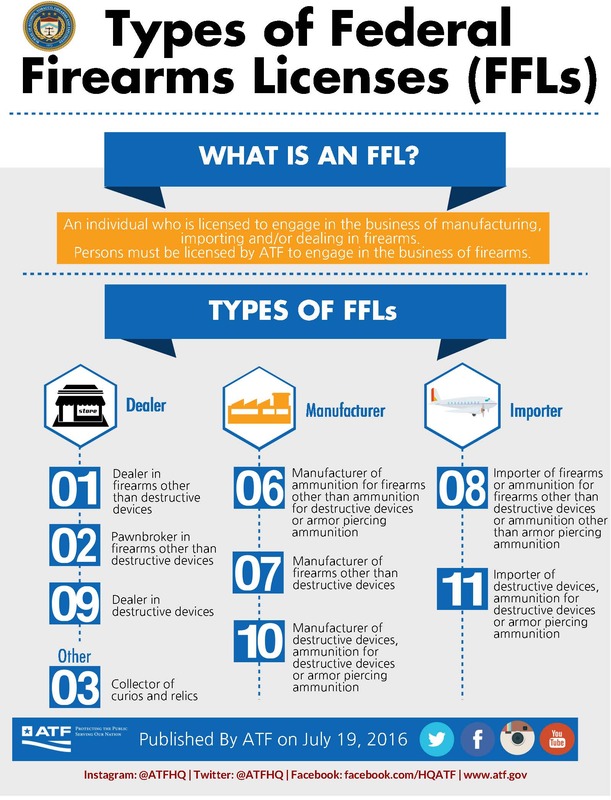 Persons must be licensed by ATF to engage in the business of firearms. 01 – Dealer in firearms other than destructive devices. 02 – Pawnbroker in firearms other than destructive devices. 09 – Dealer in destructive devices. 06 – Manufacturer of Ammunition for Firearms Other Than Ammunition for Destructive Devices or Armor Piercing Ammunition. 07 – Manufacturer of firearms other than destructive devices. 10 – Manufacturer of destructive devices, ammunition for destructive devices or armor piercing ammunition. 08 – Importer of firearms or ammunition for firearms other than destructive devices or ammunition other than armor piercing ammunition. 03 – Collector of curios and relics.